Photo Credit: Denmarsh Photography, Inc. The 24,350 sf. Center for Sustainable Landscapes (CSL) at Phipps Conservatory and Botanical Gardens was conceived as a world class building that provides both a home for administrative and classroom functions and a tool to further the institution's stated mission, "to advance sustainability and promote human and environmental well-being through action and research." The project affords an extraordinary opportunity to demonstrate the positive impact that buildings can have on the environment. Starting with a dilapidated brownfield which was once used as a fueling and supply station for the City of Pittsburgh's Department of Public Works, the 2.9-acre site now hosts one of the world's greenest buildings, a landscape of native plants, and a slate of science education programs held in indoor and outdoor classroom spaces to foster the growth of tomorrow's environmental stewards. As part of the public guest experience at Phipps, which attracts more than 350,000 visitors a year, the CSL maximizes public interaction with sustainable technology. Significant aspects of the project including a synopsis of project goals. Phipps Conservatory and Botanical Gardens' mission is to inspire and educate all with the beauty and importance of plants; to advance sustainability and promote human and environmental well-being through action and research; and to celebrate its historic glasshouse. The mission of the organization is evident in the beauty and spirit of the Center for Sustainable Landscapes. A restored brownfield is now a productive place that takes what it needs from what is available to it and provides a healthy environment for life to thrive. True to the Phipps mission, the ongoing work at the CSL is based on recognizing vital and positive connections between people, plants, beauty, health, and focuses on awakening children to nature and encouraging sustainable and healthy lifestyles. 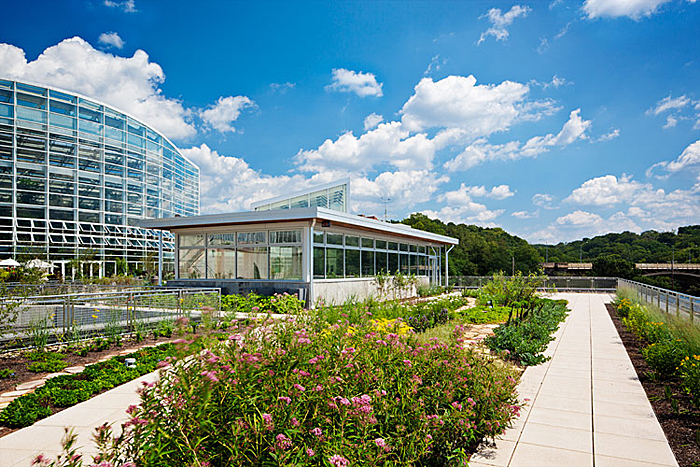 The Center for Sustainable Landscapes (CSL) at Phipps Conservatory and Botanical Gardens incorporates green building technologies, passive strategies, and natural processes in tandem to generate all its own energy and treat and reuse all water captured on its site. Recognizing that public gardens, museums, and other institutions are uniquely positioned to demonstrate the benefits of leading with one's values, Phipps sought to design the CSL as the nucleus around which a holistic rethinking of building, operational, and public engagement protocols could evolve to inform the experience of every visitor that walks through Phipps' doors. The CSL is located on the Phipps campus' southwest corner, nestled into the hillside on a 2.9–acre remediated brownfield lot once used as Pittsburgh's Department of Public Works storage facility and service yard. The site had suffered decades of environmental devastation. Underground gas tanks formerly used to fuel municipal vehicles were cleaned for reuse as storage for sanitary water. Indigenous, sustainable plants and soil were brought in to rebuild the hillside nearly from scratch. Today, a terraced garden leads downhill from the roof to the ground floor of the CSL, allowing visitors to walk through a trail of native plant communities, including wetland, rain garden, water's edge, shade garden, lowland hardwood slope, oak woodland, and upland groves. Between the surrounding landscape and the building's green roof, over 150 species are represented, providing habitat for local wildlife and serving as a demonstration for residential application of native plants. This transformation demonstrates both the aesthetic and functional benefits of sustainably-focused site restoration. The Center's landscape in the fall and winter. In order to achieve the building's net-zero energy goal, the CSL team had to work together toward an efficient, functional goal. The CSL's orientation maximizes southern sun exposure, and light shelves, louvers, and overhangs contribute to 80% daylight autonomy while minimizing summer cooling loads and contributing to heating in winter. The building envelope and high-performance wall and roof insulation reduce heating losses and cooling loads. Fourteen 510–foot-deep geothermal wells provide a 70% reduction in heating and cooling energy needs. A BMS monitors, controls, and provides feedback to ensure efficient operations. The building operates at 18.5 kBtu/sf/yr, a mere fraction compared to traditionally designed office spaces. Its energy is provided by photovoltaic arrays and a vertical axis wind turbine, together capable of producing up to 130,000 kWh/yr. Surplus power is directed to the other campus facilities. Horizontal shading device wraps around the façade of the Center. Installation of the geothermal system. Human health and safety are paramount considerations for any Living Building project; with this in mind, every material element of the CSL was subjected to a thorough analysis of ingredients and their sources to ensure transparency. Pushing manufacturers to closely examine their supply and manufacturing chains, forging solutions, and training construction crews and subcontractors to properly document materials, the CSL project team emerged with findings which will ease this important process for future projects. The project site can store enough water on-site to meet the building's needs while reducing impact on water conveyance and municipal sewage treatment, as well as its associated costs. Rainwater is captured from not only the CSL site but the substantial rooftop space of the adjacent Tropical Forest Conservatory. Among the storm water treatment system's principal components is a lagoon which replicates natural water treatment processes that occur in wetlands and marshes while providing habitat for native plants, fish, and aquatic turtles. Sanitary water from the CSL and adjacent maintenance building is treated by a constructed wetland that utilizes plants, sand filtration, and UV filtration to disinfect the water to gray water standards. An Epiphany Solar Water System, in one of its first deployments anywhere, uses parabolic solar dishes to generate heat and power multi-stage distillation units to further treat sanitary system water to pharmaceutical standards. This water is used to water Phipps' sensitive orchid collection. Sanitary water and constructed wetlands. View to the Center from the Lagoon. In keeping with the outreach efforts of Phipps, the CSL is designed to maximize public interaction, beauty, and inspiration. Through talks and presentations, docent-led tours, and dynamic science education programs, Phipps uses the CSL as a platform to reinforce the importance of human/environment interactions with particular emphasis on green space in the city, urban gardening, healthy food initiatives, and urban-based sustainable building practices. Phipps' is also conducting conservation psychology research on the effectiveness of art and communication as tools for changing the way that people interact with the world around them. As increasing numbers of people discover the vision and goals at work at the CSL, they will be encouraged to mount similar projects at the home, business, and community levels. Additionally, in the CSL's dedicated indoor and outdoor classroom spaces, Phipps gives area children new ways to connect to nature. With a goal to operate as efficiently and elegantly as possible, the design and construction challenges faced by the CSL team were without historic precedent. A sweeping palette of technologies had to be coordinated with passive design strategies to achieve the building's goals of net-zero energy and water. The sun, earth, and wind had to be harnessed to heat and cool the building as natural methods cleaned wastewater for reuse; a massive underground system of cisterns and other storage infrastructure had to manage storm water. A brownfield had to be restored to showcase native plants and provide wildlife habitat, and the overall project had to comply with four rigorous certification systems. 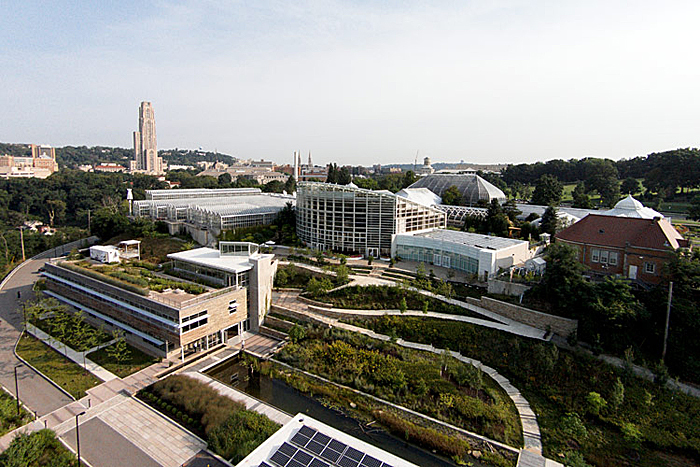 To ensure that the CSL would push the global green movement forward, Phipps opted to restrict their core design team to talents within Pittsburgh and Pennsylvania. At the same time, Phipps recognized the value of engaging an international community. By including the University of Pittsburgh and Carnegie Mellon in the design process, the team gained the knowledge and experience of professors and graduate students from Germany, Singapore, China, Bulgaria, and Iran. Phipps decided early on that this revolutionary facility required an equally revolutionary design and planning process, one which leveraged geographical proximity to maximize in-person contact and relied on in-depth, hands-on understanding of the local landscape and climate. The team utilized an integrated design methodology requiring the architect, engineers, contractors, and other advisors to work together in person to create one-of-a-kind building systems informed by one another and operating in tandem. In sharp contrast to conventional design phases, in which compartmentalized pieces of a given project are completed independently and slotted into the system at a later point, the entire CSL team met for multiple day-long design charrettes throughout the process. The resulting increase in knowledge and ability to take maximum advantage of synergistic opportunities proved essential to bringing the CSL vision to life. While planning and designing to a high standard are necessary components, maintaining the same commitment through the construction and occupation periods presents additional challenges. Sub-contractors received training to help them not just understand the processes specific to this job, but why these protocols were in place. Demonstrating that their involvement in a project like the CSL built their professional capacity and translates into unique skill sets for future projects helped ensure contractor buy-in and consistency. Team members collaborate during an Integrated Design Charrette. Operating the building has been a learning process for both the facilities team and occupants. Plug load monitors at each work station, quarterly comfort surveys, and monthly occupant meetings ensure that the CSL's performance continues to improve and occupants are engaged, informed, and above all, comfortable. The CSL is designed to operate as efficiently and elegantly as a flower, including harvesting its own energy and water. Strategic window placement and light shelves that direct the sun's rays and reflective ceiling material all allow for daylight to naturally illuminate the interior 80% of the time, reducing the need for energy-intensive artificial lighting. High-performance insulation and low-e windows manage solar gain and loss. On-site solar panels meet energy annual demand. A vertical axis wind turbine produces energy with winds as low as 4.25 mph. Geothermal wells capture heating and cooling energy from the earth's consistent 55–degree temperature. Working in conjunction with the geothermal wells, a Rooftop Energy Recovery Unit reduces HVAC energy requirements by 40%. Natural daylight floods office, stairwells, and circulation spaces, contributing to reduced energy loads and a healthy indoor environment. All storm and sanitary water is managed on-site, lessening the impact on Pittsburgh's combined sewer system. Water from toilets, sinks, and fountains is treated on-site by a constructed wetland and sand filters, and reused for flushing. A UV system further cleans the water, some of which is stored in tanks for later use. Any excess is treated by a solar-powered distillation unit that makes water suitable for irrigating certain delicate orchids. A lagoon stores rainwater while replicating the natural water treatment process that occurs in wetlands and marshes. Rain gardens, pervious asphalt and a green roof prevent run-off by allowing rainwater to seep back into the ground, while excess is stored for reuse in 80,000–gallon underground rain tanks. The CSL was built using products and processes that have been deemed as safe for occupants, as well as all species of plants and animals. Salvaged materials comprise 10% of those used, including siding made from deconstructed western Pennsylvanian barns. Recycled materials—such as structural steel, insulation, rain tanks, and flooring—account for 30% of those used on site. Regional materials harvested, extracted, or manufactured within a 500–mile radius of Phipps make up 82% of the total required to develop the building and landscape, including soil, plants, and glass. All materials were sourced in compliance with the Living Building Challenge's Materials Red List, which identifies the toxic chemicals most commonly used by manufacturers. Energy models informed the design during development. The final concept design energy model showed an EUI of 19 kbtu/sf/year with an energy usage for the building at 117,623 kwh per year. A 125.25 kW PV Solar Array was chosen for the project that was estimated to produce 135,655 kWh per year. During the 2014 calendar year, the CSL was net positive on energy by 11,185 kWh, with an actual EUI of 18.5 kbtu/sf/year. The solar system consists of one ground and two roof-mounted arrays, and the 10kW vertical access wind turbine is located northeast of the building. Based on actual meter and sub-meter readings. The project challenges the perceived mutual exclusivity between built and natural environments with a design that is sensitive to nature while meeting the highest standards in well-being for all occupants and visitors. The goal—to provide clean, civilized indoor environments for occupants—was achieved through several strategies. An outdoor weather station paired with indoor air quality sensors inform the BAS what mode in which to operate offers the highest IAQ with the lowest energy input. When conditions are appropriate, natural ventilation mode automatically opens transom windows, while emails let staff know they are welcome to open their manual windows if they see fit. When conditions require mechanical heating, cooling, or economizer mode, an underfloor air delivery system introduces conditioned air directory into the breathing zone and allows heat from internal loads to stratify above the occupants. In order to maintain high IAQ, materials were mandated to be free of any chemicals or components listed on the Living Building Challenge Red List. Live plants especially adept at removing air pollutants are at each work station, not only improving IAQ but enhancing aesthetics and biophilic connections, as well. Installing the underfloor air delivery system, one of the Center's energy efficiency strategies. The CSL was designed to function effectively in harmony with, rather than at odds with, the natural world. The building and the landscape operate as one and this very design intent ensures resiliency. The CSL generates electricity on-site without combustion and feeds the campus grid. The system has at times produced enough to satisfy demand for the entire campus and sent power back to the grid to not only reduce load on power generation systems, but add capacity. Similarly, the CSL manages all water on its site, including storm to sanitary water. The site has experienced a ten-year storm and successfully handled all of the water, including roof runoff from two adjacent buildings. The systems can clean and store water for use both at the CSL and elsewhere on campus. The CSL is well equipped to handle shocks to the system. One of the most exciting aspects is that it demonstrates a way of building and operating that does not produce CO2 and greatly reduces energy consumption, both in and of themselves are factors that could actually reduce the frequency of systemic shocks in the first place. The CSL has achieved four of the highest sustainable building certifications. These were set as goals to verify the performance through third parties and to ensure accountability, but the ultimate goal was to demonstrate the beauty of living in harmony with the natural world and to catalyze change by leading the way. As an educational institution, achieving the certifications has helped us spread this message, and ultimately inspire others that it is possible, right now, to build in a way that enhances both environmental and human well-being. The project came to fruition and was able to achieve its goals only through two years of facilitated integrated design charrettes, sessions bringing together the institution, staff, architects, sustainability experts, engineers, landscape architects, contractors, and other stakeholders. The realization of the inherent interconnectedness allowed the team to set and achieve goals that would have been otherwise unattainable. A bevy of sensors, meters and monitors track and log the building's performance, informing staff on where improvements can be made. These data are also made available to researchers at local universities who are examining myriad aspects of the project ranging from life-cycle analysis to a real-time weather, indoor environment, and occupant comfort predictive control intended to minimize energy consumption and maximize individual occupant comfort. Only by offering the project to researchers, design and building professionals, academics and others can the next generation of sustainable design be realized. On a larger scale, the CSL has catalyzed the reimagining of countless other projects at Phipps. Today, every initiative, amenity, and program is designed to be consistent with our values. The cafe features local and organic foods, and utilizes produce grown in on-site display gardens; food and material waste is composted, and bottled water and soda have been eliminated. The horticulture team promotes local, non-invasive species, utilizes drip irrigation, composts plant material, and practices integrated pest management. 100% of campus electricity is produced on-site with solar panels and wind turbines or offset by offsite renewable resources. Purchasing preference is given to sustainably produced, recycled, FSC-certified products, and the gift shop promotes sustainable, fair trade goods. Visitors enjoying the landscape at the Center. With the integrated design process, a great deal of planning and forethought went into developing strategies to help realize the goals of the project. Energy models, fluid dynamic and sun-tracking studies and other computational models were developed, studied and tweaked with input from all project partners, giving a solid prediction of key components, like energy demand and generation. But with projects like the CSL, for which there are few if any precedents, how well it would actually perform was unknown. The team knew that continued evaluation would be necessary to monitor and improve performance. And as the project was intended to advance sustainability, these date needed to be available to academics and professionals to study and disseminate. Meters, sub-meters and sensors were installed down to individual plug load which were and continue to be monitored. Trends and outliers are studied and used to enhance performance. One part of that enhancement is occupant feedback and education. Occupants attend monthly sessions to ask questions and share feedback about living in the building. Qualitative and quantitative evaluation will continue as each year provides more data about what works, what doesn't, and how this all can be implemented into every project. Everything is connected. This is true in nature as well as in design; the key lies in balance. One example of striking a balance in the design phase was in the design of the CSL windows. To achieve net-zero energy, the building envelope needed to be robust, and manual windows, if opened at the wrong time, would compromise the envelope. But the CSL was also about connecting people to nature, so hermetically sealing occupants from the outside world was counter to this. Do you trade-off a robust envelope for blocking access to hearing birds chirping on a beautiful spring day? The solution was found in honoring both, but also not just relying on a "smart" building but also on active and thoughtful occupants. When conditions are appropriate for natural ventilation, the BAS opens transom windows. The whirring of motors and an email lets occupants know they are welcome to open their window. However, when conditions are not conducive, the transoms shut and occupants are expected to close what they opened. The system will not kick on until all the windows are shut and emails continue to remind occupants to check the areas around them. Operable transom windows, controlled manually and through a Building Automation System (BAS), support the goal of allowing staff to access nature when the conditions are right. Positive and negative aspects of the process. The CSL would not have been possible without integrative design. An integrated design methodology required all partners to work together closely, creating one-of-a-kind building systems that operate in tandem. The entire CSL team met regularly throughout the design-build process to share information and find synergistic opportunities. This yielded a team that began thinking in systems. Any individual expert on the team may have been able to design or engineer their portion meeting the goals specific to that one part, but each individually would have compromised achieving the goals elsewhere. Each design charrette had team members exploring beneficial relationships amongst systems, eventually honing in on those that would meet all the needs. How building materials, systems and product selection addressed the design objectives, goals, and strategies. Natural daylighting, certified wood, and a natural landscape support sustainability and resiliency goals. Product and materials selection was one of the most difficult aspects of the project. According to the Living Building Challenge, the materials petal intent is to "remove, from a health and pollution standpoint, the worst known offending materials, and to reduce and offset the environmental impacts associated with the construction process." One component of this, the red list, prohibits the use several materials and chemicals that are ubiquitous in the building industry but have deleterious human or environmental impacts. Finding materials that were red-list compliant proved to be a time-consuming and challenging feat. The initial 60–day specification period prior to construction was not sufficient as some manufacturers were unable to unwilling to divulge the ingredients in their products. The positive that came out of this process, though, was the conversations it started with some manufacturers and suppliers. The demand for healthier products can push the market. In fact, working within the region to source FSC-certified wood for the CSL, Phipps and its partners not only established new supply chain linkages, but convinced a local millworker, Giffin Interiors, to become an FSC-certified shop. Thanks to these developments, the next major construction to pursue FSC materials in Pittsburgh will find the chain-of-custody easier to establish and maintain. The existing site was a challenging one with which to work. The CSL is located on an old brownfield site once used by the City of Pittsburgh's Department of Public Works on a plateau behind and 10 meters below the existing conservatory. The land had suffered from decades of environmentally devastating development. The entire design team was challenged with taking a site that was abandoned and poisoned and turning it into something beautiful and inspiring. Through thoughtful design and a systems approach, the site now features over 250 species of native plants as well as a lagoon that is home to native turtles, frogs, and fish. Downstream and downhill from the CSL sits Panther Hollow Lake. Runoff from the DPW site had eroded the hillside and deposited pollutants into this once clean body of water that is part of the Pittsburgh Parks Conservancy. By capturing all water on the CSL site, this runoff is mitigated, and plans to restore the lake are already underway. Synergies that resulted from the strategies implemented. The CSL is a model in synergy. The entire project is composed if integrated systems which is how its singular performance is achieved. It challenges the perceived mutual exclusivity between built and natural spaces. Wastewater from the building feeds plants in the constructed wetland, which in turn clean the water for reuse in the building. The building roof provides habitat for pollinators and native plants, while simultaneously reducing heating and cooling loads. The lagoon houses a thriving ecosystem of native aquatic life as nearby benches provide visitors and staff a serene and beautiful setting to commune with nature. Through integrated design, landscape architects, MEP and civil engineers, architects, and other partners were able to together create a project, comprised of integrated systems that function as one. Building performance is measured and evaluated through a robust system of meters and sensors. For example, in the office area, an Aircuity system measures CO, CO2, TVOC, temperature and humidity levels for each work area. This, in conjunction with outdoor sensors, informs the BAS as to what mode in which to operate. Electricity production, consumption and distribution are closely monitored, as well as water capture and reuse. Systems like this are installed throughout the site, indoors and out, helping improve performance, comfort levels of occupants, and providing researches invaluable data. For Phipps, the CSL is a mission-driven success. In keeping with the outreach efforts of Phipps, the CSL is designed to maximize public interaction, beauty, and inspiration. Through talks and presentations, docent-led tours and dynamic science education programs, Phipps uses the CSL as a platform to reinforce the importance of human/environment interactions with particular emphasis on green space in the city, urban gardening, healthy food initiatives and urban-based sustainable building practices. Phipps' is also conducting conservation psychology research on the effectiveness of art and communication as tools for changing the way that people interact with the world around them. As increasing numbers of people discover the visionary concepts at work at the CSL, as well as the potential for replication, they will be encouraged to mount similar projects at the home, business and community levels. Additionally, in the CSL's dedicated indoor and outdoor classroom spaces, Phipps gives area children a chance to connect to nature, fostering the growth of tomorrow's environmental stewards.